I won't start this post by saying, "I can't believe school starts one week from tomorrow for us!" but I will say this summer is a bit of a blur! So many great memories, carefree days, and fun times, but now it's time to move on to a new chapter- SCHOOL TIME! I shared my back to school countdown last year. But I wanted to update the look a bit, and add some new activities. 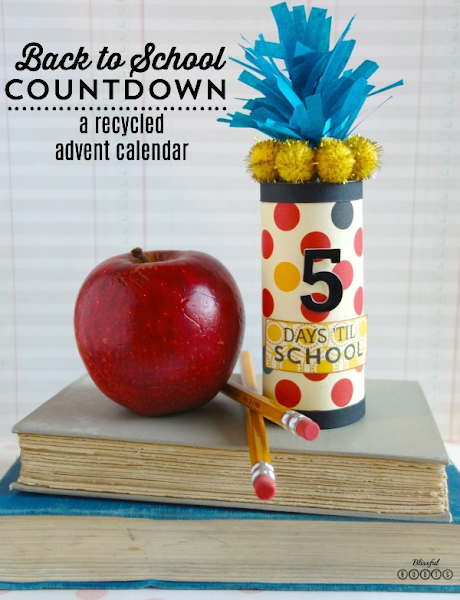 My boys ALWAYS have the first day jitters, so I like to make the days up to the first day as fun and exciting as possible, and a countdown is the perfect way to do it. You can click on the link above for more tips on making the countdown calendar, but basically I just dress up a toilet paper roll, and then put a little treat and activity inside the roll each day. We countdown the week before school, so like I said we'll be starting tomorrow! The link above also has a list of activities we do in our countdown. This year I'm adding a few new ones. You can do anything you'd like for your countdown. Personalize it for your kids, and make it fun. That first day can be a bit nerve-racking and overwhelming.